Thank goodness The Fiddlehead is flexible. Pick up the gorgeous spring issue and you can bend its soft pages this way and that, pulling an early spring toward you or stretching the snowy pages toward May flowers. Here in Fredericton it is the time of March blizzards. The terminology of the Government of Canada provides lush descriptions: freezing rain, freezing drizzle, snow grains, ice crystals, ice pellet showers, snow showers, snow pellets, ice fog, or blowing snow. 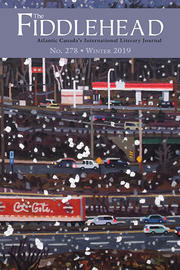 The Fiddlehead, in its spring issue, in the pages of its superb writing, can encompass all this, as well as spring showers, tulips, and pilgrims riding to Canterbury. We have arrived in the turn of seasons to our contest issue. The judges work so diligently and thoughtfully in making their decisions, so I would like to give my thanks to Kerry Lee Powell, our writer-in-residence at University of New Brunswick this fall, for her careful attention to the fiction, and to our panel of poets, Jennifer Houle, Sonnet L’Abbé, and Sachiko Murakami, for their astute consideration of the poetry. I am always impressed by the sheer range of voices and styles submitted to our contest, and how it attests to the intelligence being expressed in Canadian literature today. I enjoy the discoveries we make in this issue.